Hamid Karzai lives dangerously. As President of Afghanistan, he has survived four assassination attempts. His half-brother, Ahmed Wali Karzai, was murdered recently. His father, too, was assassinated, in 1999. Whenever he ventures outside his office in the Presidential Palace in Kabul he is accompanied by seven black-suited bodyguards – part of the 800-strong, CIA-trained cordon that surrounds the Afghan leader and his circle. Getting to meet him is an unsettling experience, requiring numerous checks and searches. This is a man who must live in constant dread that someone near him will detonate an explosion or produce a weapon – as happened to Ahmed Wali, who was shot by his own head of security as he came out of his bathroom. He has granted a rare, exclusive interview to mark the impending 10th anniversary of the beginning of the Afghan War. We meet on 11 September, a decade after the terrorists struck the twin towers and the Pentagon; by 7 October, the US and British-led military intervention against the country suspected of housing Osama bin Laden was under way. Six weeks later, the Taliban leaders had either been killed or had fled. By Christmas, the country had a new head: the westernised Pashtun leader Hamid Karzai. 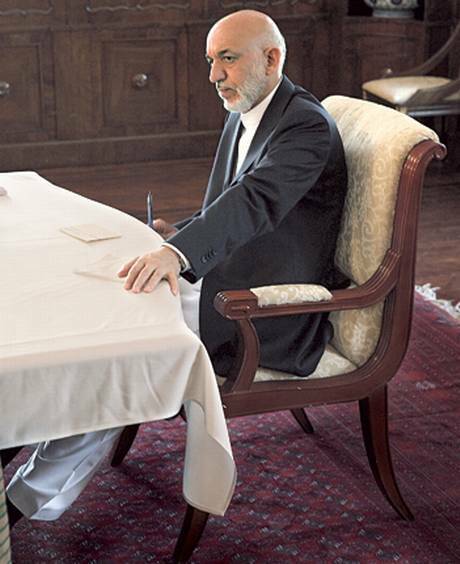 Earlier this year, Karzai confirmed that his time in power is coming to a close. He will retire, as the Afghan constitution requires, in 2014, at the end of his second term as President – the same year in which US-led forces will withdraw from a frontline role. “The American arrival was seen at the time as a liberation,” says Karzai. “They were welcomed into villages. The population rose against the Taliban. It was the subsequent mistakes that made things bad.” What were those mistakes? He talks of “treasure” and “blood”: the former denoting corruption, the latter denoting civilian casualties resulting from the abuse of power by Western forces. He has, he says, discussed this issue “repeatedly” with the Western powers, who have, finally and too late, put up their hands. “And now they admitted, they say ‘Yes, you are right’.” He does not deny that part of the fault also lies elsewhere, but he insists that “the big corruption” is due to foreign influence. “Corruption in the Afghan government, our own political circles, is also true. The small kind of corruption, bribes, is one thing, but the bigger level of corruption of contracts, hundreds of millions of dollars…” He shakes his head. Karzai’s home is the Arg-e-Shahi Palace, a fortress in central Kabul. Its 100-year-old stone walls, topped by turrets, separate him from the people he rules as much as they protect him from Taliban attack. He is accessible – but only beyond four checkpoints and after the removal of all personal belongings (wallets, pens, cigarettes) and scrutiny by sniffer dogs. Inside the palace, there is eerie calm. There are gardens lined with red and pink rose bushes; birdsong echoes from the walls. Karzai lives here with his wife, Zenat, a former doctor, and their only child, a four-year-old son, Mirwais. By his office door there are bullet holes, mementos of the Soviet occupation and the civil war. In a side room, pastoral scenes – a mountain stream, grazing camels – hang crookedly in gold-painted frames. I am not the only one waiting for an audience. The new US ambassador, Ryan Crocker, and General John Allen, commander of international forces in the country, are waiting too. Crocker has with him a list of topics that he wants Karzai to address in a forthcoming interview with CNN. “He has the hardest job in the world,” confides Crocker. Four out of Afghanistan’s past six presidents have been murdered, three of them in office. The fourth, the Soviet-backed Mohammed Najibullah, stepped down but did not flee when the mujahedin seized Kabul. He was taken from the UN compound and had his fingers cut off before being castrated, dragged behind a truck and hanged in a public square. After Karzai was named head of the transitional government following the defeat of the Taliban, he seemed to be in a strong position. He was trusted by the US – indeed, was rumoured to have worked for its intelligence services – after years spent wooing it for help against the Taliban. He was also supported not only by his native Pashtuns but also by Afghanistan’s other ethnic groups. Two presidential elections later, the situation is different. There has been a spate of high-profile assassinations, including those of his brother Ahmed Wali and his close confidant, Jan Mohammad Khan. The security situation seems to be deteriorating. According to UN figures, civilian deaths are up 15 per cent in the first six months of this year. Only this week, the Taliban attacked the embassy quarter close to the Palace, resulting in a 20-hour firefight in which the US embassy came under rocket-propelled grenade fire. Karzai is blamed for not acting decisively enough to prevent such setbacks. WikiLeaks revealed diplomatic cables from 2009 from the then US ambassador to Kabul, Karl Eikenberry, that called him “corrupt” and “incompetent” and not “an adequate strategic partner”. Unsurprisingly, meetings between US officials and the President are now limited to around once a month – a far cry from when the US ambassador might see him three or four times a week. As I enter his office, Karzai leaps up, hands outstretched, palm upwards in a gesture of greeting. He is wearing a white kameez and black suit jacket. He is charming and gracious, his English impeccable – learnt as a student at Simla in India. Only occasionally, when asked a question he does not wish to answer, does his expression darken. Then the grin is replaced by a twitch near his left eye. The President’s flagship policy has been “Big Tent” politics, an attempt to include all ethnic groups and factions in his government. This has led to the empowerment of former warlords whom ordinary Afghans associate with their country’s darkest days: the brutal civil war that preceded and precipitated the rise of the Taliban. In the course of the morning, pieces of that mosaic are shown in to see him. There’s Burhanuddin Rabbini, the country’s former president, whose seizure of power in 1992 prompted the mujahedin factions to turn on each other; there’s a parliamentarian who is having problems with a visa application for India; and there’s a tribal elder who has travelled to the capital to inform Karzai of local Taliban leaders wanting to be absorbed into the government. At lunch, Karzai is joined by a group of eight MPs from Baghdis province, angry at the lack of electricity and good roads and at local girls being prevented from studying medicine. So determined are they to make their case that, at the meal’s end, a bodyguard has to pull away a hand restraining Karzai as he tries to leave. Another complaint concerns the last presidential elections: a UN-backed electoral watchdog threw out a third of the votes cast for Karzai on the grounds of apparent fraud. In response, Karzai insists that it was the Western powers, not he, who practised electoral fraud, in a bid to weaken his powers. The diplomat I spoke to dismissed this as “paranoia” and repeated the claim that Karzai had stuffed ballot boxes. The tragedy, he said, was that he did not need to cheat, as he would almost certainly have won in a second-round run-off against Abdullah Abdullah, his former Foreign Minister. This outer steeliness is betrayed by the emotion that shows on his face: a look of devastation similar to that seen at Ahmed Wali’s funeral, when he dramatically stepped into the grave to bid a last goodbye. Then he smiles. “Let’s go for a walk,” he says. We stop. “How do you feel about living here?” I ask, gesturing around. Will things ever improve for his country? Will Afghanistan achieve the peaceful, liberal democracy that the West seeks? Yes, he says, but only if those nations are “respectful towards our religion, our tradition, and mindful of the state of our society. And does he believe that, after 10 years of death and destruction, the West truly wants the Taliban defeated? He pauses. “I hope so,” he says. It is perhaps his most telling answer of all.